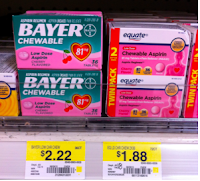 Starting 10/20 you can pick up Bayer Aspirin for only $0.55 at Walmart! This is a great stock up price! $1.66 for 3 or $0.55 a piece! Thanks, Hip 2 Save & Photo Credit: The Wally World Woman!